Already, controversy is swirling around one of the songs on Bruce Springsteen's forthcoming album, Devils & Dust. The song in question is "Reno," which has at least one anti-gambling activist up in arms for its "glorification of wagering, and the deliciously decadent lifestyle to which it leads." James Beltswaggle, of the National Anti-Monetary Betting & Losses Association, has denounced the song's portrayal of a "glitzy and glamorous ride through a modern-day Xanadu" as "folderol and claptrap." Though he admits to not yet having heard the song, Beltswaggle told the New York Post, "It's complete garbage. Bruce used to sing about being out of work, getting laid off at the shipyard, drinking raw eggs for breakfast... and now it's all high-life, rolling-in-dough fairy tales. He's a flying fruitbasket. And you can quote me on that." A special edition iPod for Bruce "The Boss" Springsteen was unveiled today by Steve Jobs and Jon Landau at Apple Headquarters in Cupertino, CA. Clearly, Springsteen was having a laugh on us when he referenced Bill Gates during his U2 induction speech... but he wasn't joking about the hardware. 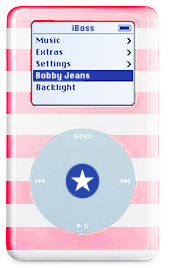 With Springsteen's signature inscribed on the back, the new iPod comes in 20G and 40G models, each of which will include his entire Columbia catalog, as well as an 80G model which will add every live version of "Bobby Jean" ever played. The "iBoss," as Jobs referred to it, is "a device that plays music." However, this one does not include a Shuffle feature; Landau explained that the original integrity of the song order is crucial to an understanding of the story Bruce has been telling over his career. But the extra touches are numerous and subtle, from the sweat-stained protective case to the "rosy" glow of the backlight. 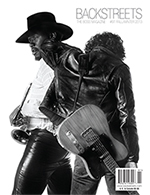 A commercial to promote the iBoss was set to feature a silhouetted Springsteen dancing the Boogaloo, which in the end was not approved. A more "generic" 15-second TV spot will be used instead, with the Apple hippie-chicks grooving to "The Hitter." What's the sound of no hands strumming? In an effort to pare down the Devils & Dust tour to its true essence, Springsteen himself will not be appearing on the tour. "When I started playing the songs with a band, I realized that I needed to strip down the sound, to create a one-to-one relationship between the audience and the musician. But these songs require so much quiet -- even when it was just me up on stage, the presentation didn't feel stripped down enough." After reportedly calling Sting for advice, Springsteen has broken up with himself -- officially, "put his professional relationship with himself on indefinite hiatus" -- in an effort to become more musically adventurous. The Devils & Dust tour will feature Bruce's guitar tech playing washes of synthesizer chords while remaining offstage; onstage, an old gypsy woman will sit on a lone stool, staring off into the night. "Remember," Bruce said, giving a last piece of advice before hopping on his motorcycle, "Dark clouds... it should sound like dark clouds." The mastermind behind Springsteen's trio of '80s dance remixes has been tapped once again, this time to bring Bruce's latest single to the hottest clubs this summer. Arthur Baker's "Blackheart Mix" of "Devils & Dust" reportedly incorporates movie dialogue from Angel Heart and Ishtar (as well as a Vincent Price sample), and is being hailed as "a Trance masterpiece" by Urb magazine. Planned to conicide with Springsteen's June 11 tour stop in Ibiza, the "Blackheart Mix" 12-inch will include a dub version and an a cappella track. Already, DJ Danger Mouse has combined the latter with "Son of a Preacher Man" for a mash-up titled "Devils & Dusty." In addition to the Dual Disc, Devils & Dust will also be offered in the brand new Crual Disc(TM) format. After the initial purchase, the Crual (short for "accrual") Disc requires listeners to enter their Social Security number and credit card information on their remote controls each time they wish to listen to the CD. Each listen will cost only $1. To make the experience more interactive, the double-sided Crual Disc must be flipped over at the end of each song. Also, the sounds of applause, "Brooocing," "shushing," and the occasional cell phone have been meticulously added throughout, creating the near-illusion of a concert-going experience. This option can be turned off for $1. If you are unable to enter the data because your CD player does not have a numeric keypad, you will simply hear the vocal overlay "AOL First Listen" every ten seconds. Said an AOL Brand Manager, "We feel it's the perfect opportunity to improve loyalty to America Online. After hearing 'AOL First Listen' 547 times by the end of the CD, how can you not feel great about us?" Springsteen intends to write songs on the "Devils & Dust" tour for a 2015 release. Gettin' caught in the rain? Do you like makin' love at midnight? You ain't alone, baby. And that's why I'm taking you back to 1979. Back when "Fire" was the biggest hit Bruce Springsteen never had, and "Sad Eyes" was just a Robert John song. Back when Leif was Made for Dancin', KISS was Made for Lovin' You, and David Naughton was just plain Makin' It. Last week we were stranded on Jay Ferguson's Thunder Island. This time, we vamoose on his Shakedown Cruise, taking to the seas for a Cool Change. We might pass some of Barry Manilow's Ships along the way, as we Sail On with the Commodores back to the dunes of the cape. Yeah, the albatross and the whale, they are our brothers... but hey, Dog and Butterfly are, too -- so we'll be taking you from ship to shore. So put on your blue jeans and meet me by the fireplace in the Shag-Carpeted Basement Rec Room. Baby tonight, by the fire, all alone, you and I... we'll be together like McFadden & Whitehead, like England Dan & John Ford Coley, like Peaches & Herb. It's gonna feel so good. If Springsteen is Thomas Magnum (Tom Selleck), Danny Federici is Rick (Larry Manetti), and Clarence is T.C. (Roger E. Mosley), who is Higgins (John Hillerman)? 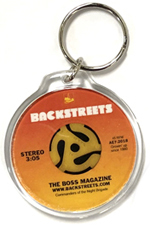 Send your answer to aprilfools@backstreets.com! Springsteen vs. Dylan: on 3/22 in "March Bandness" on Detroit's WCSX, and April 4-8 on WFUV. Saints in the City: dig a 1974 photo of Bruce and Bowie in the studio (taken by Ed Sciaky) at davidbowie.com. Check out a new CNN.com profile of Joe Grushecky: "Rock's best kept secret." Little Steven masterminds Outlaw Country radio. On March 22, Little Steven will host a screening of "Rock is Fifty!" and moderate a panel discussion with original members of Bill Haley's Comets, at NYC's Museum of Television & Radio. According to Billboard, long awaited Boss/Killer duet to be released in May or June. Bruce's 11/20/98 appearance on Charlie Rose available now at audible.com and in the iTunes Music Store. The latest exhibit at DC's Govinda Gallery: Ken Regan's photos of Dylan's Rolling Thunder Revue, including one of Bruce and Bob backstage in '75.